Sub: Use of Sports facilities of Sports Authority of India under Come & Play Scheme in Swimming (at Talkatora Stadium), Badminton, Table Tennis & Fitness Centre for Central Government Employees & their dependent families regarding. The Central Civil Services Cultural & Sports Board (CCSCSB) under administrative control of the Department of Personnel & Training (DOPT), a nodal agency for promotion of Cultural & Sports activities amongst the Central Government Employees in the country, had started a scheme for use of Sports facilities of Authority of India under their Come & Play scheme in Swimming (at Talkatora Stadium). Badminton. Table tennis and Fitness Centre for Central Government Employees & their dependent families members. The details of the Come & Play Scheme are available at http: www.sportsauthority»findia.nic.in – Schemes – Come and Play Scheme. 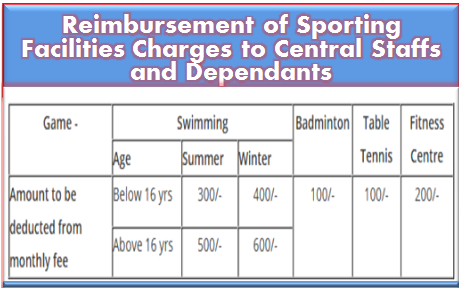 Under the scheme, the Central Government Employees & their dependent family members may use sporting facilities for Swimming (al Talkatora Stadium), Badminton, Table Tennis and Fitness Centre (excluding Sauna Facility) of the Sports Authority of India (SAI) at their rates (on monthly basis) or rates available for Central Government employees and their dependent family members, whichever is lower. 4. Reimbursement will be done directly to bank accounts or the beneficiaries linked with Aadhaar number. It may be noted that this scheme is one of identified schemes of DOPT- for DBT on-boarding. 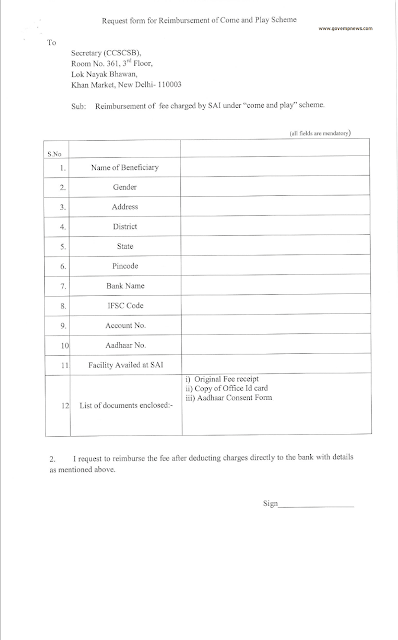 The bank details (like Account number, Bank & Branch name. 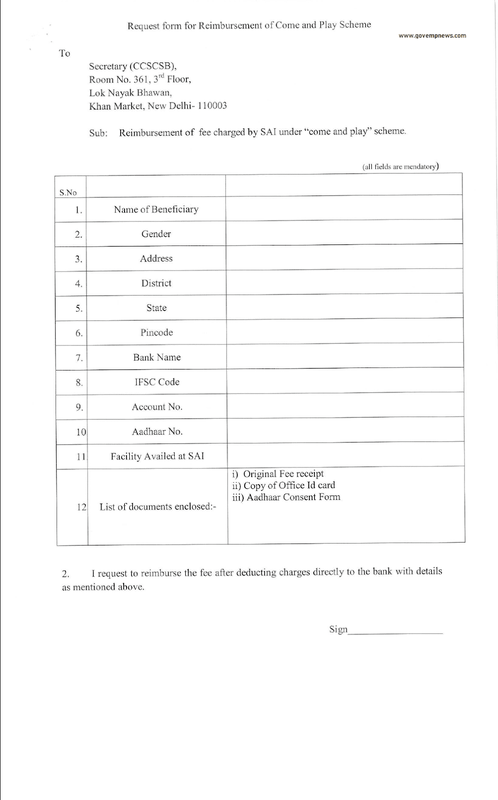 IFSC code & Aadhaar Number), a copy of Aadhaar, a copy of Office ID Card and a proof of dependent (if required) need to be furnished while submitting payment receipts for reimbursement, directly to the ‘ ‘Secretary (CCSCSB), Room NO. 361, DOPT, Lok Nayak Bhawan. New Delhi-110003. 5. All Ministries /Departments are requested to disseminate this circular for wide publicity in the Ministries/ Departments and their attached & subordinate offices.